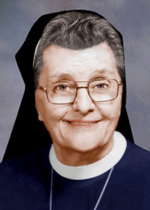 Sister M. Catherine Dunleavy, I.H.M. Sister Catherine Dunleavy, I.H.M., formerly Sister Catherine de Ricci, died July 7 in Camilla Hall, Immaculata, in the 74th year of her religious life. She was 95 years old. Born in Philadelphia, Sister Catherine entered the congregation of the Sisters, Servants of the Immaculate Heart of Mary in 1941 from Visitation B.V.M. Parish, Philadelphia, and professed her vows in 1943. She taught in the elementary grades for almost 50 years in schools of the Archdiocese of Philadelphia and the Dioceses of Allentown and Metuchen, N.J. She was assigned to Camilla Hall in 1990. The funeral Mass was celebrated in Camilla Hall Thursday, July 10. Msgr. Joseph Logrip was the celebrant and homilist. Father William Dean was the concelebrant. Sister Catherine is survived by members of her IH.M. community and her loving nieces and cousins. She was predeceased by her parents Patrick and Anne Cunniffe Dunleavy and brothers Joseph, John (Mildred), Martin (Helen) and her sister Ellen (Charles) Brooks.